Sharmini Hensen is a trained Life Coach and certified Master NLP (Neuro - Linguistic Programming) Practitioner who is passionate about empowering women to look for solutions within themselves and moving them into action and ultimately, achieving success and happiness. Her take is “when your relationships work, your life works” as she believes true success and happiness lay in the quality of our relationships; business, personal and most importantly, with one’s self. 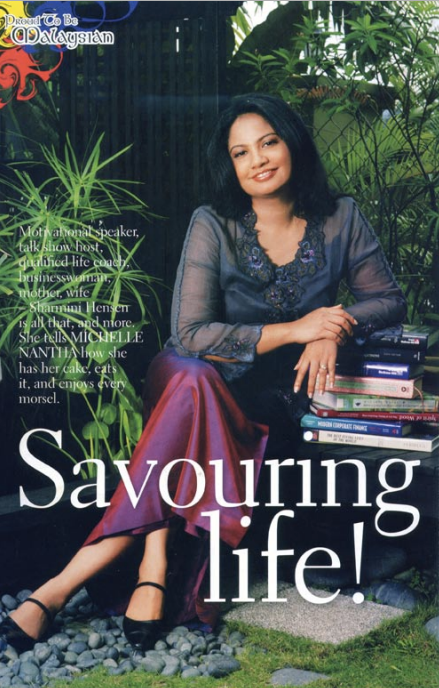 Sharmini Hensen aspires to be Asia’s leading Life Coach, coaching her viewers to create excellent relationships in their life through her very own television program. Her motivation and rationaleIt gets overwhelming trying to be “superwoman” in this super age of overrated achievement and material competition. Good is not good enough. Excellence is the new standard of measurement. And when you have achieved that, what’s next? Unconsciously, and sadly, more and more women are giving up on their relationships especially with their children and partner. All is not lost. We can recreate love and reconnect with our loved ones. There is a solution to all problems. We need to look within the heart of who we are and awaken to what is truly most important to us. Love is our highest value. Every thing we do is for or because we dont have love. It is my vision to raise an army of Lovers! The world does not need anymore warriors, we are in dire need of lovers. Be an exemplary one! Learn to love and accept yourself unconditionally so you can love another the same. Be forgiving every moment. Learn to trust yourself and flow with life. Follow your bliss. And all ways, may you be happy and prosper.